Drunk driving accidents change lives forever. It is estimated that 1,100 people were killed in a drunk driver accidents in 2013. This means that three people die each day in Texas due to a drunk driver accident. The Law Offices of David Kohm have experienced drunk driving accident attorneys that are committed to upholding the rights of those injured by those that have caused accidents by driving while intoxicated. There are laws that have been put in place to protect people who have been involved in a drunk driving accident. Texas law allows drunk drivers to be prosecuted, and those individuals may face jail time or be required to pay fines. They may also get their license revoked. 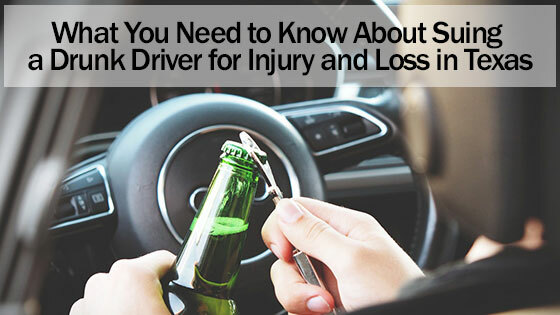 There are several factors that affect the severity of the punishment that the drunk driver receives. This includes whether or not the crash resulted in an injury or death. The punishment will also depend on whether or not this was the person’s first time driving while drunk. Drunk drivers who injure a person in an accident can face up to 10 years in prison. People who kill another person while driving under the influence may be charged with intoxication manslaughter. They could face up to 20 years in prison. Prosecuting the drunk driver will not take away the pain of an accident. However, there are many benefits that can be obtained from prosecuting a drunk driver. The drunk driver will be taken off of the road, which will prevent other people from being killed or injured in an accident from this individual. If you were injured in an accident or had property damage, then you may be able to get compensation. Most people are well aware of the fact that people who kill someone while drinking and driving can spend a long time in jail. You can turn on the news and hear about a person being killed by a drunk driver just about every day. However, it can be difficult to obtain compensation from a drunk driver. First, you have to be able to prove that that the drunk driver caused the accident. Even though drinking and driving is dangerous, many people are able to make it home without getting into a car accident. There are other factors that may have played a role in the accident. Such as weather and road conditions, driver operating error or vehicle malfunction, it is important to have an experienced drunk driving accident attorney on your side that knows how to litigate these types of cases and maximize your compensation. Even if the person was driving while intoxicated, the insurance company may try to argue that the victim was responsible for the accident. For example, they may try to say that the victim was in the driver’s way, or they were speeding. Additionally, insurance companies will often deny a claim. This may force you to file a lawsuit and obtain the services of an experience drunk driving accident attorney. If you choose to file a lawsuit, then it is important to note that the bar or restaurant that sold the driver the alcohol may also be sued. Alcohol is a drug that can affect a person’s ability to make decisions. That is why the government has rules that govern who can sell and buy it. For example, the Texas Alcoholic Beverage Commission forbids bars and restaurants from selling alcohol to people who are already intoxicated. If a place sells alcohol to someone who is already drunk and this person gets into an accident, then the establishment can be held responsible. There is nothing that can eliminate the hurt and pain caused by a drunk driver accident. However, compensation can help. Call our law offices today at any of our convenient locations to get a free consultation.